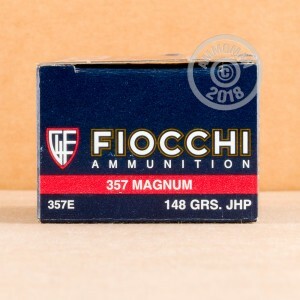 These .357 Magnum cartridges from Fiocchi are an effective choice for defense and hunting while still being affordable enough to shoot at the range. This 1,000-round case offers considerable bulk savings for fans of this powerful caliber! Each cartridge in this case propels a medium weight 148-grain jacketed hollow point (JHP) bullet to a muzzle velocity of 1,500 feet per second. This high velocity promotes fast expansion and strong terminal ballistics. When fired through the longer barrel of a rifle, this ammo achieves even greater velocities (with much lower felt recoil) and can be used to take game at close to medium distances. This ammo also excels at the shooting range since the hollow point bullet's semi-wadcutter profile punches clean, visible holes in paper targets for easy visibility from the firing line. 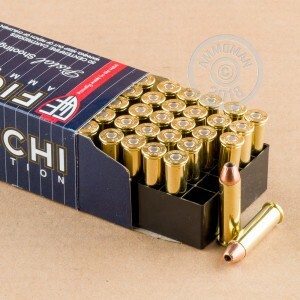 Fiocchi ammunition is loaded in both the USA and Italy using noncorrosive Boxer primers and reloadable brass cases. Grab this case or any other items totaling $99 more to get free shipping from AmmoMan.com!